Genesis 12:1-3 – God promises to make a great nation of Abraham and his descendents; to bless Abraham; to make his name great; to make him a blessing; to bless those who bless him and curse those who curse him; and to bless the world through Abraham. Genesis 12:7 – God promises to give the land of Canaan to Abraham’s descendants. Genesis 13:24-17 – God officially gives the land of Canaan to Abraham and his descendants and promises to make Abraham’s descendants as numerous as the dust of the earth. Genesis 15:8-18 – God performs a one-sided covenant ritual with Abraham, making the responsibility to keep the covenant solely God’s. Note: GOD made HIS covenant with Abraham and his descendants. It was that HE would be their God, and that they would possess Canaan. AND THE COVENANT WAS ETERNAL. God has NOT, and NEVER will, abandon Israel as His chosen people. If He did, He would be breaking the covenant that He made with Israel, that He accepted sole responsibility in keeping; and He would not be faithful and true. To verify that God planned to keep His covenant with Israel (Abraham’s descendants through Isaac and then Jacob, who’s name God changed to Israel) check out Jeremiah 31:35-37 and Jeremiah 33:23-26 where God says the sun, moon, and stars, day and night, would have to cease to exist before He would cast off Israel from being His people. Christians, we must support Israel. We must pray for Her. We must defend Her. We must aid Her. And we must remember that we are members of Her as believers who have been grafted into Her body – Romans 11:16-24. It is through Israel’s Messiah that we receive salvation and eternal life. It was through the Jews of the early church that the Gospel was brought to us, the Gentiles. Now it is through us that the Gospel must be carried back to Israel, to God’s chosen people, to receive their own Messiah, as God more and more softens their hearts of stone and removes the scales from their eyes so that they may see and accept the truth. There is a common belief among Christians today that the Church has replaced the Jewish people as God’s chosen people. Another equally confused belief is that the New Testament Covenant was meant only for the Church, and not the Jews. Whereas the Old Testament Covenant was meant only for the Jews, and not the Church. Both of these beliefs are misguided and wrong. For some time now I have felt God’s leading as He has pulled me closer to the Jewish people. Funny thing is that I don’t believe I know a single person of Jewish descent. It really began when I was studying the book of Romans. Paul states fervently in chapter 11 that it is the duty of the Gentile believer to materially support the Jewish people because it is through them that we are spiritually blessed. It is in this discussion that Paul points out that the Gentile believers are grafted into the Olive Tree which is Israel. He never states that the Olive Tree was uprooted and a new tree was planted in its place. Once a person becomes a believer and receives salvation through Jesus Christ, Yeshua, he is grafted into the base tree, Israel. In essence, the spiritual roots of the believer, Gentile or Jew, are Jewish. God grafts us together and we become one spiritual family. I have come to consider myself a spiritual Jew or Israelite; a spiritual descendant of Abraham. I have been studying the Torah (1st 5 books of the Old Testament, often called the Books of Moses, or the Books of the Law), from the perspective of Messianic (Christian) Jews. There is such a rich understanding of the Torah through the eyes of their culture! It is an understanding I can’t possibly come to with my own genealogical background and culture in which I grew up. I have learned so much, and look forward to learning much, much more as I continue the study. I wish I could sit for hours each day to pour over it, but unfortunately I don’t have that kind of time. To be sure, there is a lot of legalism within the Orthodox Jewish religion. But that is not what I am talking about. I am talking about Jews who have come to recognize Jesus as the Messiah, the Son of God, the One who was promised to them as their Savior. When they study the Old Testament with their background in the culture it was written in, and in light of the New Testament (and the New Testament in light of the Old)…WOW!!! Oh, and yes, I absolutely believe that the Old Testament Covenant is every bit as much for me as a Gentile as it is for the Jew. And vise verse. The New Testament Covenant is not just for the Church, but for the Jews as well…those who believe in Jesus as Messiah. This goes to the earlier comment about the Dual Covenant. The belief that the Old Testament is for the Jews. The New Testament is for the Church. If we are indeed grafted into the Jewish people, their spiritual roots, then the Old Testament Covenant is just as much for us as it is for them. That includes the laws and the festivals. There are very specific meanings behind the festivals…and direct connections to the fulfillment of prophesy. There is meaning there that we can never know without rejoining to our spiritual roots in the Messianic Jewish community. The Old Testament Covenant did not end with Jesus. He said, “Do not think I came to destroy the Law or the Prophets. I did not come to destroy but to fulfill. For assuredly, I say to you, till heaven and earth pass away, one jot or one tittle will by no means pass from the law till all is fulfilled.” (Matthew 5:17-18). Jesus did not abolish the Old Testament Law or Covenant. It is still in effect today, and prophecies connected to the fulfillment of God’s covenant with Abraham are being fulfilled even now. As for the New Testament or New Covenant, let me ask you this. Who was Jesus speaking to when He said the following: “This cup is the new covenant in My blood, which is shed for you.” (Luke 22:20). He was speaking to His disciples…Jews. Jesus made the new covenant with Jews first. Not the Gentile church. Is it for the Church? Absolutely! But it does not exclude the Jewish believer. So, the new covenant is for the Church, Gentile and Jew alike. And the Old Testament Covenant is for the Jew and the Church alike, as people who share the same spiritual roots. How can we bless Israel if we boast against her? If we view ourselves as her replacement, and look down our noses on the people from whom our Messiah, and theirs, came? And how can we be blessed with the insight and knowledge they offer as the people and culture through which God gave His Word, the Bible? Do not curse Israel. They remain God’s chosen people, and as a believer, you are a spiritual member with them. Bless them. Come alongside them. Support them. Learn from them. And be blessed. Do you ever wish you could have a do-over? You made the wrong choice, said the wrong thing, some how just really messed things up, and you want nothing more than to turn back the hands of time and do it over, but differently. I don’t know about you, but I experience this several times a day! Of course, no matter how badly I want that do-over, I am not going to get it. I did what I did. Said what I said. The mess I made is here to stay. And I will just have to deal with the consequences the best that I can. This imperfect life, and its constant battle with sin is so frustrating! Have you ever noticed there are some interesting parallels between the beginning stories of Moses and Joshua? That is because there is a do-over played out in the history of the people of Israel. Let me show you. Moses began his call to service when God spoke to him through the burning bush. He was told to remove his sandals because he was standing on holy ground (Exodus 3: 1-6). Joshua had a similar experience soon after Moses died and he took over leadership of the Israelite people. The Commander of the Lord’s army (Jesus pre-incarnate) stood before Joshua. He told Joshua to remove his sandals because the place where he stood was holy (Joshua 5: 13-15). Under Moses’ leadership, the Israelites left Egypt during the night after they celebrated the first Passover Feast. Forty years later the Israelites had entered the Promised Land and celebrated the Passover Feast before beginning their conquest. The very next day they began eating the produce of the land, and the manna stopped coming. God used the parting of the Red Sea to instill trust in Himself and Moses (Exodus 14: 21). Again, forty years later, God used the parting of the Jordan River to show God’s great power and to demonstrate that He was with Joshua as He was with Moses (Joshua 3: 7, 15-17; 4: 23-24). Just like the Israelites, when we mess up, we bear the consequences. They lost an entire generation to the wilderness. We lose relationships, the respect of our children, opportunities to help others and do what honors God, our witness for Christ. Sometimes the damage can be repaired. Sometimes the consequences are permanent. But God loves us. He understands more fully than we do ourselves that we are not capable of living up to His standards. And He loves us. Did I say that already? I’ll say it again. GOD LOVES US!!!! Every time we sin, He gives us the opportunity to repent; to confess and turn away from what we did wrong, and get it right the next time. So no, we don’t get do-overs. But thank the God of grace and mercy that we do get one chance after another, unlimited, until the day that His work in us is complete!!! Moses Died and HE Buried Him: What can you take away from Moses’ death? There are so many prophets in the Bible. Good ones. Lots of good ones. Isaiah, Jeremiah, Daniel, Hosea…the names of the books of the Old Testament is a litany of prophets. They were God’s messengers to His people. It was what they asked for. When God gave the 10 Commandments to Moses on Mt. Sinai, God was present there. The Bible says there was thunder, a trumpet, lightening, and smoke rising from the mountain. The people of Israel were terrified! “They shook with fear and stood far away from the mountain” (Ex. 20:18). The people of Israel didn’t want to speak with God face to face, out of fear and reverence. So God spoke to Moses instead. Every message He had for them came through Moses. It was an amazing time! God was physically present with them day and night! He was in the pillar of cloud traveling before them during the day. He was in the pillar of flame traveling before them at night (Ex. 13:21). When Moses met with God in the Meeting Tent, God was present in a cloud that lowered over the tent (Ex. 40:34-35). Moses was not un-effected by this. Remember how we are told that his face shown so brightly after talking with God that he covered it when he wasn’t speaking with God, or sharing God’s message with the people (Ex. 34: 33-35). Moses had a relationship with God that fills me with awe and wonder! While God spoke to other prophets through dreams and visions, He spoke face to face with Moses. He didn’t show Moses visions that needed to be interpreted, He spoke clearly, straight forward, with no hidden meanings (see Numbers 12: 6-8). God said exactly what He meant to say, and there was no mistaking the message. God trusted Moses to lead Israel. God even allowed Moses to see His glory (Exodus 33: 18-23). But Moses disobeyed God. Exodus 20: 6-12 tells us that Moses was told to speak to a rock and water would come out for the people. But Moses was angry with the people for their complaining, and he struck the rock, not once, but twice. Moses’ punishment for this sin was that he would not be allowed to cross over into the Promised Land. God told him the punishment was because he didn’t believe God, and because he didn’t honor Him before the people. Eventually the people of Israel arrived at the Jordan River. All the laws had been given. Those who had not believed in God in the first place had died. Their children were going to inherit the Promised Land, and they were poised and ready to go. 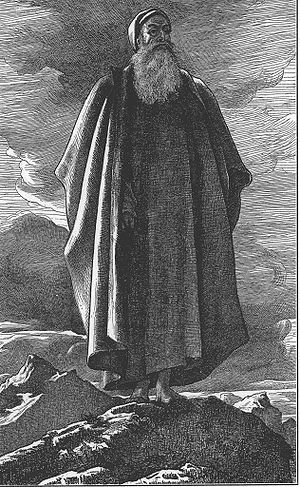 God called Moses up to the top of Mount Pisgah in the land of Moab. There he was allowed to see all of the Promised Land, the richness, the beauty. But there he would die, held back from ever entering what he spent his life working toward. It must be noted that Moses did not die of old age, even though he was old (120 years). Deuteronomy 34: 7 tells us that his eyes weren’t weak, and he was still strong. He didn’t die of a sickness. He just died. But he didn’t die alone, either. God was with him. Only God. When it was time for Moses to leave this earth, even though his untimely death was a direct result of his disobedience to God, God was there with him. God loved Moses so much that He took him in an intimate and personal way, known only to the two of them. They had shared so many of these face to face times throughout Moses’ life, this must have been the most natural and fitting end. I wonder how God took Moses’ life. I can’t see Him striking Moses with a bolt of lighting, or burning him with flames. Maybe it was just a touch, and He caught Moses’ body in His arms as he fell. Or maybe God did what he wouldn’t do earlier. Maybe He showed Moses His glory, and he died struck by the very sight of Holy God. God Himself lovingly buried Moses there in the valley opposite Beth Peor (Deut. 34: 6). Perhaps one of the most touching scenes in the Bible, when we see played out before us, the love of God for just one man. I admit I cried when I read it. But what are we supposed to take from this? Is it just another story in the Bible? Is there a lesson to be learned? I don’t know. I am left with this, though, an intense longing to have that kind of relationship with God. To have His trust. To speak to Him face to face. To see His glory. I want my face to shine from being in His presence!! What about you? What has God put in your heart today? May the God of Moses show you His glory today!